Internet Marketing involves many components; chief among them are Paid Search and Organic Search. Some do not know the difference. Others don’t know whether, and under what circumstances each should be used. Paid Search is the placement of advertising on the first page of Search Engine Result Pages (SERPs). SERPs are always unique because they are generated based on the searcher’s entry of a keyword or a keyword phrase. So, the availability of advertising space on the very first page of these results is most attractive. Most Paid Search, such as Google Adwords, is driven by a bidding model where the advertiser must bid a Cost per Click (CPC) to have their ad placed. The bid is for keywords/phrases that the advertiser wishes to have visibility for. Paid Search Ads appear generally above and to the right of the organic results; so, in essence paid ads compete with naturally occurring results for the attention of surfers. Organic Search is listings and not paid for. Organic Search Rankings are earned or achieved by convincing the Search Engines that you are more relevant for a particular keyword or phrase than those below you in the rankings. The method of achieving high search engine rankings is known as Search Engine Optimization (SEO). Organic Search Engine Ranking is driven by relevance. Relevance is driven by high quality content in the form of articles, press releases, podcasts, blogging, videos and much more. It is the regular introduction of new, unique, non-duplicate content to the website, a well SEO-friendly website architecture and the promotion of the content to drive increases in organic backlinks that form the essence of SEO. It is rare that a PPC campaign can or should be maintained as a standalone approach to internet marketing. If you need convincing, please understand that 85% of all online searches do NOT result in a paid click. Understanding this, why invest your entire online marketing budget in only 15% of the market? The key advantages of PPC are (1) You can get immediate results and (2) You don’t initially have to do anything to your website, at least not your home page. Online Searchers are almost 7 times more likely to click on the organic results in a SERP (Search Engine Result Page) than a PPC or sponsored ad. The long term ROI is of successful organic results resulting from SEO is obviously much superior to PPC. 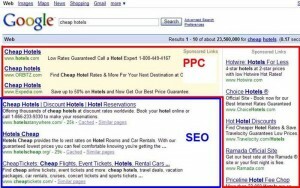 PPC Managment requires experts so it does not hold true that you can really do PPC by yourself. If you want real long term results but you also want to generate immediate traffic and sales, you should use PPC to achieve the short to intermediate term results needed while you are building your organic presence. This will also provide important data points that should be used to help guide your SEO efforts; often this data will help prioritize the keywords so that you can focus on the most profitable or most opportunistic keywords in your content generation and syndication efforts. As your organic results become clear and obvious through statistical analysis, you should then seriously consider trimming back your PPC dollars to focus those funds on other more productive short and long term marketing efforts. Optimum7 feels that unless you seek to maximize your name brand recognition, PPC should be considered a finite process. In contrast, SEO is forever; 1st page Google results can only be maintained through a consistent never ending process of content generation and the content syndication and promotion methods intrinsic to any successful internet marketing strategy. So you should know understand here in one writing both the difference between Paid Search and Organic Search as well as the general principles involved as to when and where they should be used. Are you ready to get started using PPC or Organic Search to improve your online business performance? Contact us for a no obligation initial consultation.